At least seventy-four people were killed in skirmishes between Morsi supporters and armed men this weekend. The corpses emerge from a field hospital near the Rabea al-Adeweya mosque every few minutes in a grim routine. First, a man on a megaphone strides purposefully out into the sun, announcing the name of the dead to the waiting throng of mourners—the Grand Marshal of a macabre parade. Behind him come the medical workers carrying the body on a fluorescent orange stretcher. The white shroud is invariably splattered with blood, the name and hometown of the deceased is scrawled across the front. Hands and feet have been tied together to prevent limbs from flopping out. Two lines of men with linked arms form a thin passageway through the crowd that leads to a waiting ambulance. Pleas to God fill the air, rising to a crescendo of grief and anger as the body passes through. The commotion subsides until the next body is brought out, and the scene repeated. The protesters, many of them wounded, tell a different story. Several claimed in interviews that they did little to provoke the security forces, who began firing tear gas canisters as the crowd approached, and that they responded by hurling back rocks at police. After around two hours of skirmishes, the police and other armed men opened fire on the crowds with live ammunition and shotguns, the protesters say. Fearing an all out raid on the sit-in, Morsi supporters built brick walls on the street to prevent security forces from entering. The battle raged for hours along Nasr Street, a wide thoroughfare that runs in front of the military viewing stand where President Sadat was assassinated in 1981. Doctors at the field hospital say they were overwhelmed by the number of casualties that flooded in as the clashes intensified through the early morning. 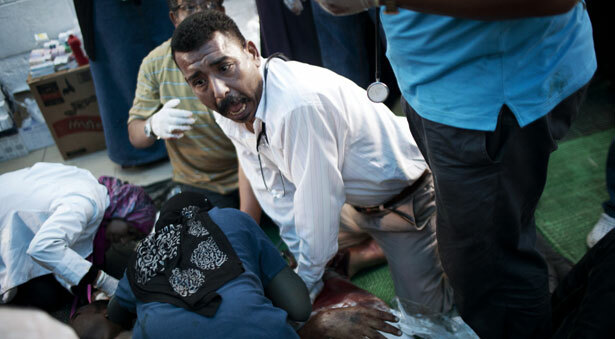 Dr. Mostafa Talaat, a volunteer medic, said most of the gunshot wounds he tended to were in the head, neck and chest. “They were shooting to kill and it seems they used snipers because many of the gunshot wounds had a downward trajectory,” indicating they were shot from above, he said. The clashes came after a day of dueling rallies on Friday across the country for and against the ousted president in response to a televised speech on June 24 by the head of the army. Sporting dark sunglasses and full military regalia, Defense Minister Abdel Fattah al-Sisi called on Egyptians to rally across the country to give him a popular mandate to confront “violence and terrorism,” widely seen as a reference to Morsi’s supporters. Sisi’s address was viewed as a prelude to a harsher crackdown on the Muslim Brotherhood and the forcible breakup of their mass sit-ins in Giza and Nasr City. The group has already seen its leaders imprisoned and charged, assets frozen, sympathetic TV stations shut down and protesters killed by the dozen. Over the past four weeks, Morsi supporters have committed violence of their own. Armed pro-Morsi demonstrators have clashed with local residents across the country resulting in numerous deaths and injuries and leaving neighborhoods seething with rage. There have also been accounts of torture and abuse of “infiltrators” at pro-Morsi sit-ins. Meanwhile, militants in the Sinai Peninsula have carried out daily attacks against security forces, killing at least twenty policemen and soldiers. Meanwhile, sympathy from those who vocally opposed police brutality in the past has been tempered by the fact that the Brotherhood ignored rampant police torture and killing of protesters while they were in power—either in the presidency or parliament—choosing instead to promote officers and label demonstrators opposing Morsi’s rule as thugs and criminals. State media and private television channels and newspapers have helped whip up growing anti–Muslim Brotherhood sentiment, demonizing Morsi’s supporters as terrorists hellbent on violence, diseased with scabies and infiltrated by Palestinians and Syrians, stoking xenophobia. On Friday, several major television stations cancelled regularly scheduled drama series and entertainment shows that follow Iftar—the sunset meal breaking the fast in Ramadan—and are a staple in Egyptian society, to cover the pro-military rallies and encourage people to join in. Tamarod, the petition gathering campaign that helped orchestrate Morsi’s overthrow, backed the army’s call, as did the National Salvation Front, a loose coalition of non-Islamist political groups. Yet some critics of Morsi and the Brotherhood did reject the pro-military rallies—such as the April 6 Youth Movement and several prominent revolutionary activists—though they were a minority. Meanwhile, the military made its presence felt, deploying soldiers and armor. Apache helicopters swooped low over the cheering crowds. Demonstrators posed for photographs next to smiling soldiers. Even police officers, long the arch enemy of protesters in Tahrir who launched the 2011 revolution on National Police Day to address police brutality, strolled amiably through the square. Al-Sisi’s face was omnipresent on the streets. Vendors hawked posters, T-shirts and buttons bearing pictures of the army chief, sometimes depicted alongside former president Gamal Abdel Nasser. The pro-Morsi rally was only several miles was across town, but the two scenes were worlds apart. The Muslim Brotherhood had dubbed it the “Friday to bring down the coup” and organized thirty-four marches in Cairo alone in defiance of al-Sisi’s speech. The largest rally was at the Rabea al-Adeweya mosque, where demonstrators waved pictures of Morsi and chanted against the military, whistling in derision at helicopters flying overhead. Three bearded men on a moped wound their way through the crowd. “Terrorists coming through, make way for the terrorists,” the driver joked with a smile. The prospect of Morsi being reinstated has grown increasingly far fetched. The deposed president has been held incommunicado by the military since July 3. According to a report in the Associated Press, military intelligence agents have questioned him at least once a day, sometimes for up to five hours, focusing on the inner workings of his presidency and of the Brotherhood. On Friday, civilian prosecutors announced they had launched an investigation into Morsi on charges of murder and conspiring with the Palestinian group Hamas, marking the first formal legal measures leveled against him. Prosecutors ordered him detained for fifteen days pending investigation and the interior ministry said he would be transferred to Torah Prison, where Mubarak is being held. The potential for further bloodshed remains high. Interior Minister Mohamed Ibrahim has warned Morsi’s supporters that they will soon be dispersed from their largest sit-ins where thousands have lived for weeks. Ibrahim also said he was reinstating a state security agency that under the Mubarak regime was responsible for monitoring religious and political activities and was known for carrying out torture and forced disappearances. “The untechnical restructuring of the Interior Ministry after the revolution, and the abolition of certain departments, are the reasons for the extremist activities that we see now,” Ibrahim said. Critics view the move as part of a broader effort by the old security apparatus to reconstitute itself and tighten its grip once again, this time with public support. The deepening crisis has dismayed many of the revolutionaries who struggled to overcome successive authoritarian regimes—Mubarak’s government, the direct rule of the Supreme Council of Armed Forces and the Brotherhood—only to see the military and old security apparatus rise again, perhaps entrenching themselves even deeper into Egyptian life. Sharif Adbel Kouddous opines on whats next for the Muslim Brotherhood?